You may contribute online by credit card or debit card. For now, all immediate contributions online require a credit card or a debit card through the secure credit and debit card processing gateway Stripe.com. The Nineveh Plain Defense Fund does not receive nor store any actual credit card or debit card numbers. Approximately, 3% of your contribution will go to card processing transaction fees. At this time, the Nineveh Plain Defense Fund is not registered as a tax deductible organization, but we will be pursuing this designation and hope to obtain this status by the end of 2016. Your team leader designates and may change your reporting status. You may still contribute apart from your team with a different reporting status by making a separate contribution as as individual without designating your team status. Would you like your contribution to be kept anonymous? 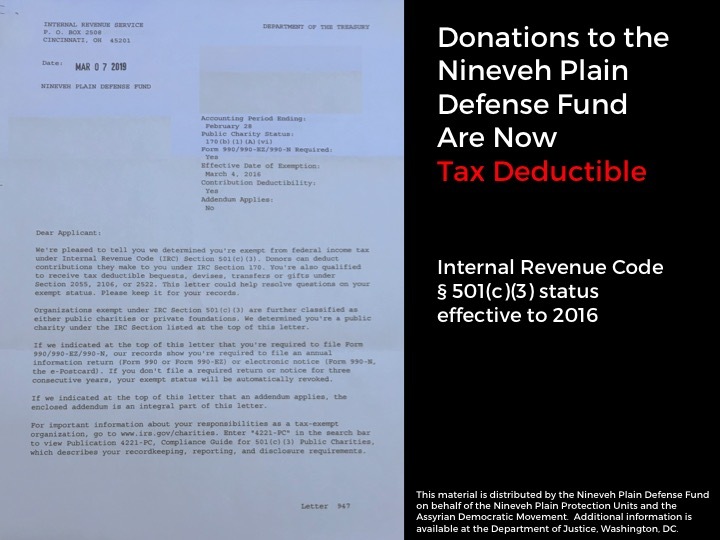 The Nineveh Plain Defense Fund is a non-profit corporation in the State of Illinois, established in 2016. The Nineveh Plain Protection Units requested the formation of the NPDF by a group of activists and supporters to create a legitimate channel for directing international support to the NPU. The Nineveh Plain Protection Units were established in 2014 by the Assyrian Democratic Movement after the invasion of Mosul and the Nineveh Plain by the Islamic State. In March, 2016, the Nineveh Plain Protection Units officially joined the Nineveh Liberation Operation Command, the campaign being led by the Government of Iraq to defeat the Islamic State and liberate Nineveh and other occupied territories. This material is distributed by the Nineveh Plain Defense Fund on behalf of the Nineveh Plain Protection Units and the Assyrian Democratic Movement. Additional information is available at the Department of Justice, Washington, DC.